An exclusive amenity for our resort guests, Paradise Springs opens Memorial Day through Labor Day for amazing Grapevine waterpark adventures. Thrill your family with Gaylord Texan Resort's western-themed, 10-acre resort pool and lazy river complex featuring entertaining water features and tasty cuisine. 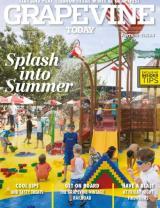 Lawn games and sunbathing decks are among other highlights at the Grapevine waterpark, rated 2011's No. 1 Top Aquatic Resort by Waterparks + Resorts Today. The full-service Pool Bar and Grill at our Grapevine waterpark satisfies Texas-sized appetites with tasty fare including our Waygu Kobe Beef hot dog, fish tacos and chicken Caesar salad. Imbibe signature specialty drinks including our Poolside Punch and Savor the Flavor frozen margaritas.